Bearer of a billion Indian hopes for a second medal at the Rio Olympics 2016, shuttler Pusarla Venkata Sindhu produced one of the finest and most passionate performances of her career, to pummel Japan's Nozomi Okuhara into submission in the women's singles semi-final on Thursday. The brilliant 51-minute victory by a 21-19, 21-10 scoreline over the reigning All-England champion made the 21-year-old Sindhu the first player from India to earn the right to contest an Olympic badminton final, and firmly eclipsed the bronze medal winning display by compatriot Saina Nehwal at the 2012 London Games. After jousting on even terms with Okuhara for about one-and-a-half games, the gloves were off for Sindhu at 10-all in the second game. She unleashed a barrage of attacking strokes and grabbed 11 straight points in a seven-minute blitzkrieg that left her diminutive rival stunned, shocked and disoriented. Okuhara's plans of taking the match the full distance lay in tatters. 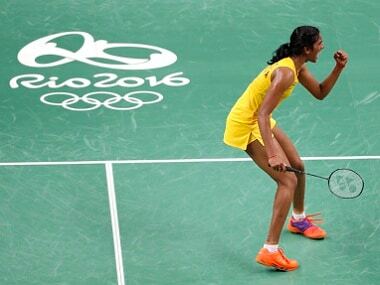 On Friday evening, Sindhu will spar with Spanish two-time world champion Carolina Marin for the coveted gold medal. Marin looked in commanding form as she dislodged defending champion Li Xuerui of China from the Olympic throne, with a dominating 21-14, 21-16 triumph. The left-handed Spaniard was in command for virtually the entire match with an impressive display of speed, power and sparkling strokeplay, and even made up a 11-15 deficit in the second stanza with a string of six points. She did have an unwarranted stroke of luck at 17-16, when her 25-year-old opponent landed awkwardly on her left knee while playing a twisting airborne overhead shot, and went over on her back with a suspected ligament tear. Following a prolonged medical time-out, in which Li got her knee strapped and insisted on continuing — much to the displeasure of her coach, former world champion, Chen Jin — the Chinese girl simply limped around the court without much hope of getting into a rally, and let Marin go through the formality of taking the remaining three points for victory. But by staying on the court till the bitter end, Li was giving herself a chance of returning for the bronze medal play-off on Friday; had she retired before the completion of her match against Marin, her name would have been scratched off the event. Even so, her chances of taking the court against Okuhara on Friday appear remote with that damaged left knee. Sindhu entered the court on Thursday with the full knowledge that she could not afford to get into a prolonged, no-holds-barred battle with one of the fittest and steadiest defensive players on the badminton circuit, one who possessed exemplary speed and footwork. While winning the 2015 season-ending Super Series final in Dubai last December, Okuhara had beaten the best in the world, including Saina Nehwal and Carolina Maran. She followed it up with the prestigious All-England title in March this year. And she had won both by engaging her opponents in the most excruciatingly long and energy-sapping rallies she could conjure up. Ergo, Sindhu came up with a gameplan completely different from the one she had used against China's 2011 world champion Wang Yihan in the quarter-final. Instead of consistently playing lengthy rallies, as she did against Yihan, the Indian gave the 21-year-old Okuhara no rhythm at all, punctuating short, sharp rallies with some long ones where the players covered every corner of the court in their attempt to catch the opponent out of position. Okuhara did depart from her normal procedure by playing aggressively in the initial reaches of the opening game, but some resolute defending allowed Sindhu to move out into an initial 7-4 lead, which she enlarged to 11-6 at the breather. The lanky Indian used her height (where she had a nine-inch advantage over the 5’ 1” Okuhara) and reach to attack her opponent's backhand and finish off the returns with steep smashes to untenanted areas. After the interval, the pint-sized Japanese began to claw her way back, and reduced the margin to 10-12, and then to 13-15 and 15-17. Sindhu's familiar end-of-game nerves duly kicked in, and Okuhara came within striking distance at 17-18, and then 19-20. But the Hyderabadi lass kept her composure, and made sure that she had the first game in her satchel. After an initial 3-0 breakout in the second stanza, Sindhu was reeled back by some robust retrieving by the Japanese girl, and thereafter, barely a point separated the two antagonists until the midway mark. The rallies were very even and absorbing, but one could tell that the Indian was tiring. Sindhu held a wafer-thin advantage at 11-10 when the players went into the lemon break. The lead could have been a bit more substantial, had the Indian not missed two absolute sitters from mid-court, in her haste to finish the points by the short route. No doubt the errors occurred as a result of mistiming the kills since she was on to the shuttle a micro-second late. The general expectation at that juncture of the match was that Okuhara would step up a gear and make Sindhu play longer rallies, and exploit the fact that the Indian looked more than a little winded at that stage. But to the utter consternation of the sizeable Japanese contingent in the crowd, quite the reverse took place. As coach Pullela Gopichand later observed, "That breather at 11-10 in the second game marked a watershed moment in the match. I was sure that one of the two players would crack under the immense pressure at that point, and I was hoping it wouldn't be Sindhu. When she got a couple of quick points upon resumption, she simply piled on the pressure, and it was the Japanese girl who could not keep pace." Having got her second wind during the interval, Sindhu suddenly upped the ante, and played two points at blinding pace. Okuhara was completely thrown by the tactic, and became just a little tentative and prone to errors. Sitting on a 13-10 lead, Sindhu went for broke, the adrenaline pumping furiously in her system, and the accurate, aggressive strokes flowing with great vigour and elan. There was even a whiplash backhand smash as she rushed the net behind an overhead half-smash. 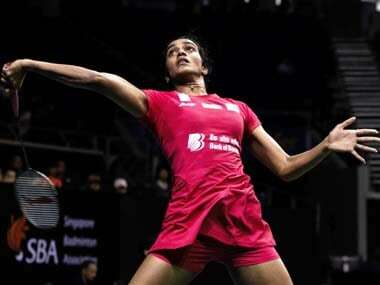 As point after point got added to Sindhu's kitty, her opponent's resolve broke completely. As the Hyderabadi powered to 18-10, her supporters hoped against hope her end of game nerves wouldn't manifest in a typical clutch of unforced errors. But Sindhu would have none of it today. Confidence continued to drip off each of her closing strokes, including a late deceptive drop at the net with a turn of the wrist that caught Okuhara back-pedalling in anticipation of a push to the body. And when, at match-point, the Indian followed up a fierce hit into her rival's body with a thunderous follow-up smash that brooked no response, she had taken the final 11 points of the match in an unbroken reel. Pusarla Venkata Sindhu has just claimed a quartet of notable scalps in Michelle Li, Tai Tsu-ying, Wang Yihan and Nozomi Okuhara. Now only Carolina Marin stands between her and the ultimate prize at these Olympics.